Permanent Price Reductions And New Additions To The WiiWareWave Coin Shop! Good Deals And New Download Codes Available! Based on member feedback we have slashed the prices of our premium images and game downloads in our member coin shop! A couple premium images were removed and La-Mulana and Final Fantasy III are now out of stock. 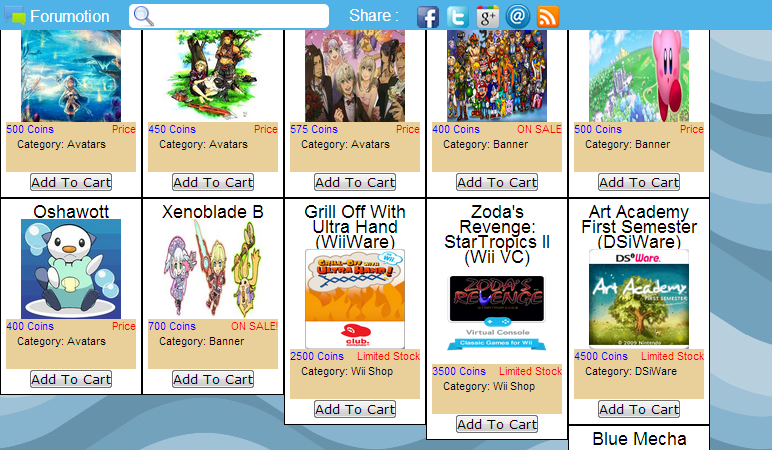 We have added Grill Off With Ultra Hand (WiiWare) for 2500 coins, Zoda's Revenge: StarTropics II (WiiWare) for 3500 coins, and Art Academy: First Semester (DSiware) for 4500 coins! You can earn coins for posting and being nice or helpful in our blogs and forums! Will you be purchasing anything now that our prices are much more reasonable? Let us know in our comments! Re: Permanent Price Reductions And New Additions To The WiiWareWave Coin Shop! Fixed a typo, btw our two copies of Zoda's Revenge: StarTropics II have already sold, so the game code is now out of stock, but we still have 3 copies of Grill Off With Ultra Hand and 2 copies of Art Academy: First Semester in stock! I already got my download code for Zoda's Revenge: StarTropics II the code worked too so thank you WiiWareWave staff! I would buy some premium goodies, but I don't think that the download codes would work on my Wii or 3DS. I won an Australian WiiWare download ticket for Castlevania Rebirth a few years ago that I have no use for at an Australian forum. I can send you the code if you would like even though there is a good chance that it has expired by now, but you never know! Thank you, Kushina-chan! I do find horror themes frightening; are the Castlevania games scary? GamerZackX wrote: I do find horror themes frightening; are the Castlevania games scary? No, I wouldn't say they're scary. They're just really gothic. Castlevania The Adventure: Rebirth is a really good game, though. It's actually a reiteration of the original Gameboy title. Which is also currently available on the 3DS VC, but the controls are extremely stiff and clunky. Which kind of ruins the game's potential. I think Konami was trying to right their wrong with Rebirth.